Seven years ago, I went to a funeral in Wells. The cathedral was full, and I, like many others, watched on big screens outside on the green. Someone royal was there, and there were representatives from several European countries. It was all filmed and was later shown on the television news. So whose funeral was it? That of a statesman or a politician? Or a famous actor, perhaps? No, none of those. It was the funeral of an ordinary working man. No-one had heard of him until he was a hundred years old, when he finally broke his silence and began to speak about a war in which he had taken part as a young man: World War One. After that, he found fame as one of the last surviving Tommies; he travelled to France to take part in memorial services, he co-operated in the writing of a book about his life, he appeared in documentaries, speaking movingly about the pointlessness of war, he met the great and good. 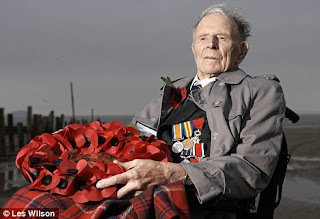 One by one, his contemporaries died, till finally he was the only one left: Harry Patch, the last fighting Tommy. He died when he was 112. I've written about him before - you can see those posts here and here. And what do you see there? And now to remember a musician and poet who died last week - Leonard Cohen. This is a reading he did recently of the famous poem written during the First World War by John Macrae, a Canadian doctor - so it's a sort of double remembering. Thanks to Alison Arlington for this, a friend who posted it on Facebook. how very moving, thank you for sharing this and for the post about Harry Patch. Heart breaking. Thank you, Katherine and Ruan. Thank you for this remembrance of Harry Patch and for the very moving recording of the Flanders Field poem. This is so moving. I have been grieving the loss of Leonard C. His rendition here of In Flanders Fields is deeply felt. Dear Harry Patch, what a fellow to reach 112. I don't think it is heartbreaking but a tremendous achievement. I think the waste and trauma his young life was subjected to is heartbreaking. Thank you for the post, Sue. Yes - and in his book, which I think I must have lent to someone because I can't find it - he speaks so movingly of the grief at the death of his two close friends that never left him - and so angrily of the governments that sent so many men out to kill and be killed.